Few materials offer the richness and brilliance emeralds do, so when the opportunity to slip on a show stopping emerald ring rolls around, be sure to make the most of it. The emerald is a statement stone that speaks for itself. The main wardrobe rule to remember when wearing an emerald ring is to keep it sleek and simple. Clothing with clean lines and solid coloration is best suited for showcasing this gemstone. Wearing a loud ensemble with a bold emerald piece will confuse the eye and detract from the overall look. Neutral tones look best with the deep green of the stone. Black is the ideal shade as it brings out the vibrancy of the stone’s color while complementing its depth. The same applies to makeup and hair. Keep it classic and elegant. Use the jewelry as a focal point and wear clothing that brings out its greatest features. Depending on the cut of your outfit, one bold statement piece on the hand might make your head to toe look feel a bit unbalanced. You can combine other pieces of jewelry with an emerald ring, but the same concept of simplicity applies. Since the ring is worn lower on the body, you might consider wearing small-scale earrings or a delicate pendant. As emeralds are bold standalone stones, they do not mix well with many other types of gems. Neutral diamonds and plain metals will accent the emerald well without detracting from it. Silver toned metal, as opposed to gold toned, will reflect the purity of the emerald’s color and enhance it. Emeralds of course can be worn with other emeralds, but it is important to consider scale. A large ring worn with large earrings or a sizeable necklace can easily look overdone. 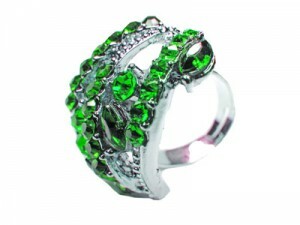 Emerald stones, especially those set in rings, require special care and precautions. They are not meant for everyday wear. Emeralds tend to be brittle and most have tiny natural cracks that make them vulnerable to chipping and shattering; the less contact with the stone, the better. It is best not to wear the ring on your dominant hand so the chance for accidents is kept to a minimum. Never wash your hands or apply lotion with the ring on as this will damage the stone, affect the color, and dull its shine. Always put the ring on last, after you have applied makeup, styled your hair, and dressed. Even little snags or smudges could potentially harm the stone. While perfect for formal events, wearing an emerald ring anywhere else is risky, so carefully consider where you are going before putting it on. Let yourself sparkle and shine without worrying about damaging your prized precious jewel. Black Diamonds vs. White Diamonds: What Is the Difference?